Why bother covering up when it’s so much more glamorous letting it all hang out? 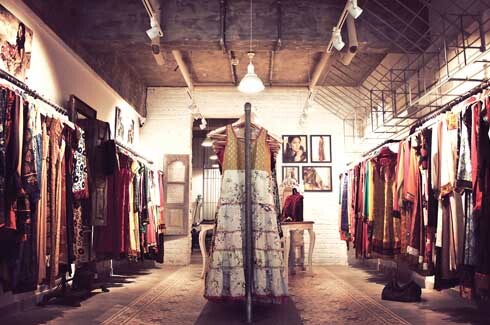 At fashion designer Priyadarshini Rao’s store in Khar, Mumbai, the air-conditioning is non-ducted, an unfinished ceiling exposes a network of industrial pipes, the walls are exposed brickwork and the floors unpolished cement. Just the kind of décor you would expect to see in a hi-fashion designer store in Mumbai, right? Perhaps not. After all, the sight of metal pipes and hanging wires hardly fits our standard notions of beauty or fashion. 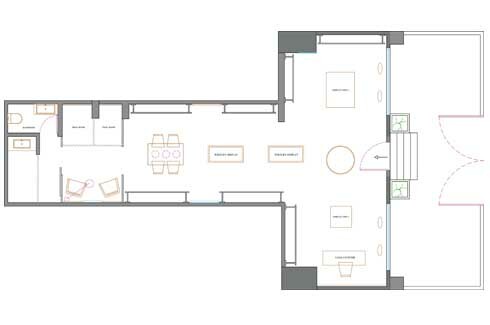 But here we are, gazing at this 1,600 sq. 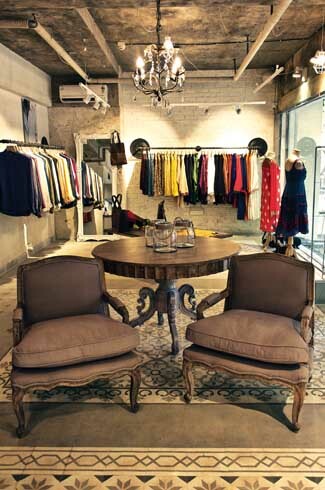 ft. fashion store, captivated by the post-modern vintage look that interior designer Tejal Mathur has successfully pieced together. The store’s imagery keeps one guessing about the provenance of the label. Though the name Priyadarshini Rao is a giveaway, the styles could have originated from any part of the world. 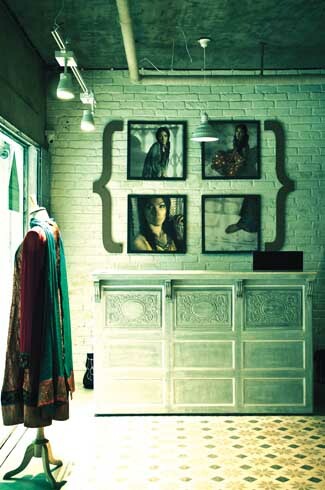 As luck would have it, the store space in Khar had justifiable volume to create the look. The design team created the industrial effect with a smooth amalgamation of pale brick walls, an unfinished ceiling, an open pipe network and suspended industrial lamps. Since the fashion designer clearly stated her preference for a neutral, toned down space – “indulgent but not harsh on the clothes or wearer”- the final look treads a fine balance between over-the-top grunge and a Brooklyn loft. Complementing the neutral palette of grey, brown and white are vintage furniture pieces and a medley of striking design accents. Several of these pieces were sourced from Agra, Pondicherry and the flea market in Mumbai. Without doubt, the large engraved plates which hold up rods for the hanging racks are the real scene-stealers. Included in the store’s furniture are also pieces from Ironworks, a furniture brand created by Tejal. Items like the carved mirror and white metal lamps, she reveals, were created exclusively for the store. For all its exposed pipes and wiring, the store exudes an aura of decadence and old-money. This is largely in part due to the high-backed vintage chairs that sit around imposingly along with ornate chandeliers that hang from 12 feet high. This sense of luxury is extended even to the trial rooms where elements like a vintage chair recreate the experience of a private boudoir. “Every woman should feel like this space belongs to her for the time that she spends here”, states Tejal. 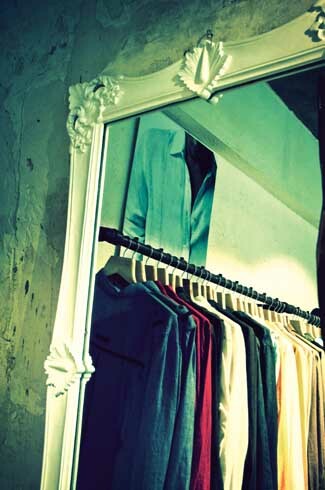 There’s an appreciable contrast between the textures and colours of the store’s interiors and the clothes on the racks. And somewhere the differences converge to create a pleasing effect. Tejal who seems adept at balancing contrast offers an insight into her thinking, “We wanted to use the handmade cement floor with a carpet design to act as a meeting point between the grunge elements of the walls and ceiling and the earthy stone tones of the delicate embroideries on the fabrics.” This she feels is a “subtle representation of the space that has become quite androgynous person like. With close to 400 clothes displayed on the racks, it was imperative that the store’s design elements be kept to a minimum. What’s more, by sticking to a neutral imagery Tejal has further ensured that Rao can display both her Indian and Western collection in the same space. Though there are a few Asian accents, the provenance of the label is generally ambiguous – a feature that Rao happily endorses. 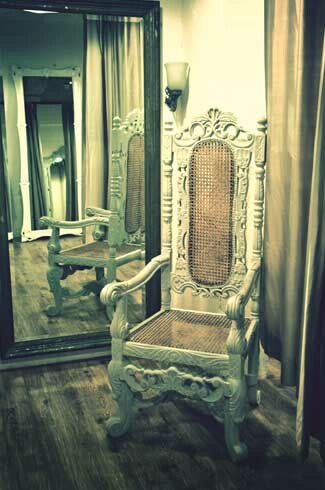 Some of the furniture, like this carved mirror for instance was created by Tejal’s brand Ironworks, exclusively for the store. Instead, she feels these spaces in Mumbai have been grossly ignored and undervalued. She warns, “It is obvious that we are fast losing precious areas in the central part of the city that could have reflected some history of the industrial or factory era.” Hopefully we still have a chance at saving our valuable past.